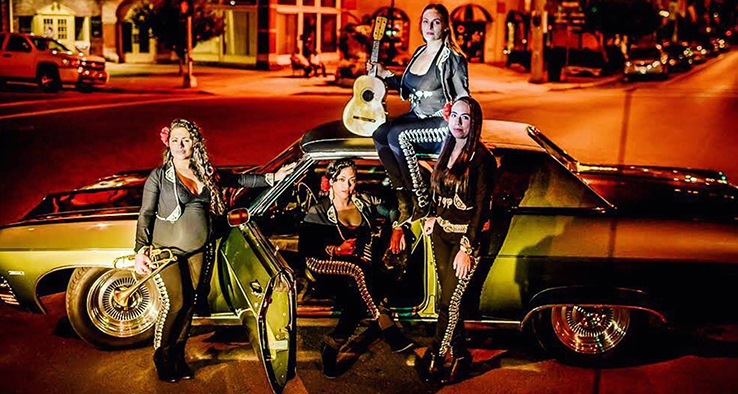 Latin Grammy winners Flor de Toloache make New York City history as its’ First and Only All­-Women Mariachi Group. Founded in 2008, Mariachi Flor de Toloache is lead by singers Mireya I. Ramos (founder) & Shae Fiol (founding member). Reminiscent of the early days of mariachi the group started as a trio, Harp, Violin and Vihuela. Today, Flor De Toloache performs as a full Mariachi ensemble. The members hail from diverse cultural backgrounds such as Mexico, Puerto Rico, Dominican Republic, Cuba, Australia, Colombia, Germany, Italy and the United States. This defines their unique flavor and sound. The result of this cultural bouquet is an edgy, versatile and fresh take on traditional Mexican music. They coalesce as would a band of sisters, with a grace and vibrant beauty that casts a spell over their audiences not unlike the legendary Toloache flower still being used in Mexico as a love potion. While working to preserve centuries old traditions of Mariachi, their melange of the traditional and the modern pushes the boundaries of the genre and brings Mariachi music to new audiences.